Bud Light Football Night in Jacksonville: Fans can enter to win tickets to many different football games in the southeast. Jacksonville University Night: Alumni and students will celebrate the start of another year at Jacksonville University. GATE Petroleum Night at the Ballpark: Spin the wheel at the GATE table on the concourse to win great prizes. Budweiser Thirsty Thursday: Fans can purchase $1 12-oz. and $2 24-oz. beers adjacent to the Budweiser Tiki Terrace, along the right-field concourse, and at the Oasis concession stand behind section 115. $1 small sodas are sold at the concession stands. DJ Swagg and DJ MoneyGud will provide music at the Budweiser Tiki Terrace. Stein Mart Date Night: Bring a date and get a pair of tickets, two hot dogs, two drinks and popcorn for just $25 at the box office window on game day. Stein Mart is also giving away $50 gift cards during the game. NAPA AutoCare Family Fireworks: Fans may visit any participating NAPA AutoCare Center to get a FREE general admission ticket (reserved seat upgrade available at the Baseball Grounds of Jacksonville box office) for the Friday night game. Following the game, the Jumbo Shrimp have NAPA AutoCare Family Fireworks! Red Shirt Friday: Fans are encouraged to wear red to support the military and save $1 per ticket at the box office or donate the $1 to the Intrepid Fallen Heroes Fund. The Jumbo Shrimp wear red "Bold City" jerseys every Friday. Friday Night Lites Miller Lite Happy Hour: Miller Lite $1 12-oz. beers and $1 off craft beer specials are available in the Craft Cave near the third-base gate from gates opening until 7:30 p.m. every Friday. 2018 #MiLBCommUNITY Initiative presented by Allegiant: Along with teams across Minor League Baseball (MiLB) that provide a place of fun and enjoyment, the Jumbo Shrimp will promote unity and positive community action by visibly creating an environment of understanding, acceptance and inclusion among all fans, players and staff members. All will have the opportunity to share what community means to them on placards to be posted at the game, and through social media. One lucky fan will win a $500 Allegiant travel voucher. Prawn Prize: Community First Credit Union Jacksonville Braves Hank Aaron Bobblehead Giveaway: The first 2,000 fans through the gates receive a free Jacksonville Braves Hank Aaron bobblehead, courtesy of Community First Credit Union. Postgame Fireworks: The final fireworks show of the season follows the doubleheader. Total Air Care Military Appreciation Night: Veterans, active, retired and former military and their dependents receive free general admission or reserved tickets. All attendees with the military member must be present, and the member show an active military or veteran ID, at the box office to receive free tickets. The Jumbo Shrimp will wear camo jerseys. Baptist MD Anderson Cancer Center Home Run for Life: A patient from local Baptist MD Anderson Cancer Center will complete a Home Run for Life during the second game of the doubleheader. Labor Day Picnic: Purchase a reserved seat and the 1 p.m. to 2:30 p.m. all-you-can-eat buffet (hamburgers, hot dogs, barbecue chicken, cole slaw, beans, cookies, tea, lemonade and water) in the Sea Best Shrimp Deck at tinyurl.com/jaxshrimpportal (password "SHRIMPFAN"). A limited number of tickets are available for the picnic. "Don't Trash Jacksonville" presented by the City of Jacksonville: Love your city? Show it by avoiding and reporting littering. The City of Jacksonville's Fight Blight office is teaming up with the Jumbo Shrimp to encourage citizens to keep our city clean. Come to the game to support anti-litter efforts and learn more about how to help "deskunk" our communities. Trash stinks! Be a COJ lovebug! Not a litterbug! Half-Price Yuengling Monday: Every Monday, 16-oz. Yuengling cans are half-price. Tickets as low as $5: by purchasing in advance of game day, fans can secure general admission tickets for just $5! Military tickets for $5: Any active military member or veteran may show an ID at the box office to purchase a reserved seat or general admission for just $5 - any game of the season! Hot dogs for $2: a ballpark tradition is just $2 at every game! Jumbo Shrimp VISA® Debit Card rewards: Fans who use the Jumbo Shrimp VISA® Debit Card receive a 10 percent discount on merchandise purchases, a free small fountain drink with any concessions purchase and $2 off tickets purchased on game day at the box office. 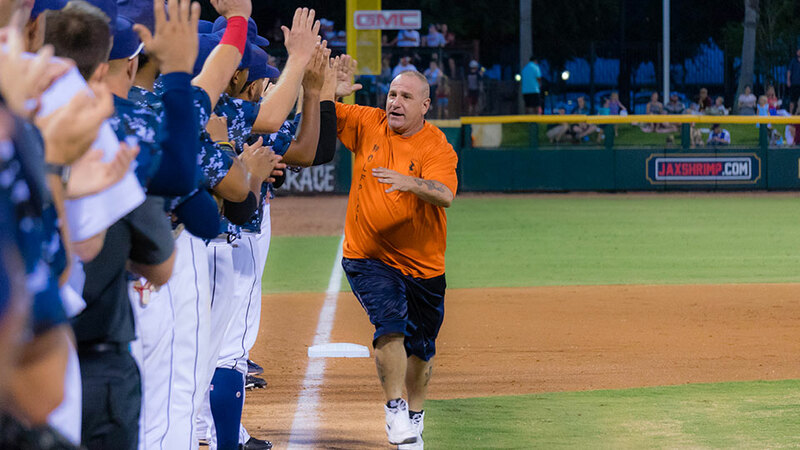 A full suite of fan discounts and other perks across the region are available through the Jumbo Shrimp's merchant program. More details here. Tickets are available at www.jaxshrimp.com, by calling (904) 358-2846, or by visiting the Baseball Grounds of Jacksonville box office, which opens at noon Saturday, 10:30 a.m. on Sunday game days and 9 a.m. daily during the week.